A gun is said to be laid when the axis is pointing in a direction which is estimated to direct the projectile to the point aimed at. 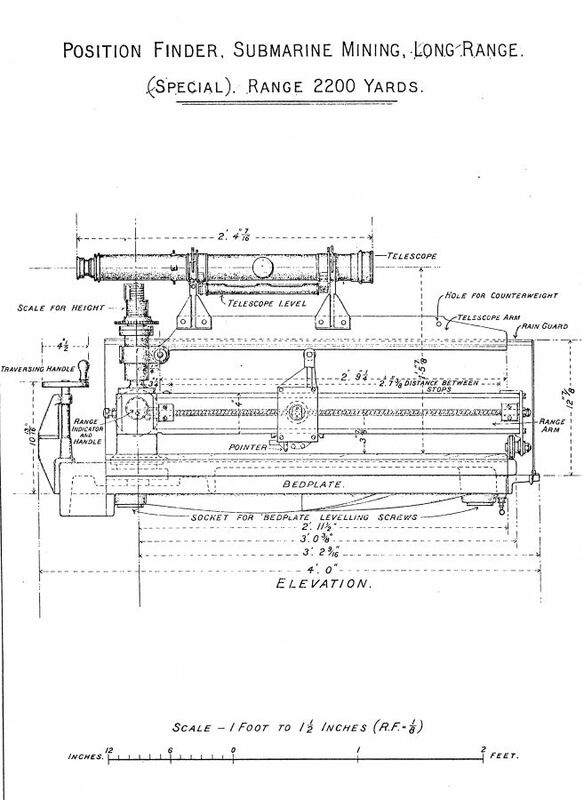 The gun is brought into the required line to achieve this by moving the whole carriage or by moving the gun on the carriage by means of elevating and traversing gears. For the uninformed amongst us the process of aiming and firing a medium or heavy gun in the Victorian period must seem simple. Assuming you can load the gun correctly, it appears that all you have to do is sight the gun, that is aim it onto the target. Then fire! This is precisely the arrangement used with early artillery. Guns originally lacked sighting arrangements. In the field an artillery piece was simply pointed at the target and fired at point blank range. It was soon appreciated that when a gun was fired in an elevated position its shot travelled further and so siege weapons were wedged up under the muzzle or their breeches sunk into the ground. Aiming and firing a coast defence gun differs from the arrangements for a field piece as the gun emplacement and the mounting is generally fixed, level and the height above the mean sea level does not change. Of course the target may be a moving one and you may need to make a little adjustment for this movement to allow for the time of flight of the projectile. Perhaps you may want to consider the length of flight to calculate the time lapse before your fuze explodes. What about the wind? Perhaps hitting the target is not so easy after all. Sighting a gun directly on a target could guarantee that you missed it. A projectile is subject to the normal rules of gravity. It will follow a curved path. Unless your target is fairly close your projectile will miss it and fall short because of the curved trajectory. (This is where the term Point Blank comes in, being the range of the gun where the projectile hits the ground, the gun having been fired with no elevation.) There is the old chestnut; which hits the ground first, the bullet fired horizontally from the rifle or the spent cartridge. Both hit the ground simultaneously, assuming no drag due to friction, because both are subject to the same gravitational force. The answer must be to aim high so that the projectile curves down onto the target [Fig 1}. How much higher you aim must depend upon the range. So first you must determine the range. Next you must elevate the gun accordingly. The elevation can be set by having a graduated dial on the gun. A table equating range with elevation would take care of that problem. But what if the target is already higher than your gun? (Or lower in the case of a coast defence gun). The range might be exact but you will still miss. Gravity tends to bring the projectile down and this can be countered by throwing the shot upwards, that is to elevate the gun taking care to direct the axis to the same height above the object as the force of gravity would draw the projectile down during its time of flight. Aim the gun sight directly at the target. This takes care of adjustments for the target being higher or lower than you. Elevate (or depress) the gun to a further amount determined by the range. You do not have to do this in this order. This method is accurate provided the difference in height between the gun and the target is small compared with the range. 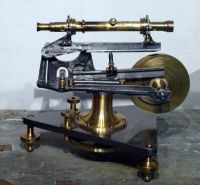 The tangent scale was used in many instances for sighting Victorian guns. It consisted of a graduated rod clamped vertically so that it could be moved up and down. When the gun layer received the range he adjusted the tangent scale by raising or lowering it according to the graduations marked on the scale. The gun was then sighted in conjunction with a fixed foresight, usually a notch in the muzzle swell. The tangent scale allowed the two procedures to be performed in reverse. First it was adjusted for the range. 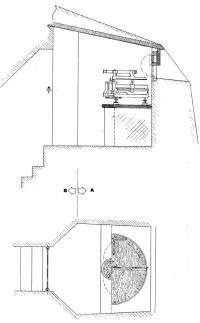 Next the gun was aimed at the target and the axis gun was thereby brought to the angle of quadrant elevation by manipulating the elevating and traversing gears. In this way elevation appropriate to the range was added to the elevation (or depression) of the gun, the gun layer having the target in his sights at all times. This simplification takes into account the effect of gravity but does not take into account the resistance of the air through which the projectile passes and some conditions of motion that tend to deflect the shot from the vertical plane. The graduations on the tangent sight are determined by firing the gun at different degrees of inclination and measuring the distance of impact at ground level. Air resistance retards the forward motion of the projectile and will therefore affect range and time. Its effect is felt in the vertical and horizontal components of motion, but not to the same extent, retardation being in proportion approximately to the cube of the velocity and area of the surface offered to resistance. With a low trajectory the time of flight will be short and the air resistance may be ignored. Drift is the deflection of a shot from the vertical plane in which the axis of the gun is directed. The causes are complex but with a right handed twist of rifling a pointed projectile will drift to the right and with left handed it will drift to the left. In British guns a right handed twist to the rifling was adopted. The amount of deflection due to drift requires a very complex calculation. It has to be determined individually for each nature of gun. The testing was done at Shoeburyness, the Army proving and test ground. Several series of rounds were fired on a still day at various elevations the gun always being laid on the same line and the elevation determined by clinometer. The shots fall in groups to the right of the line and the mean distance for each group is taken as the deviation for that range which must be attributed to drift. To correct for this drift the axis of the gun must be placed at an angle to the line of sight. The angle of drift is calculated for each range, then the mean angle of drift is found and this determines the point at which the head of the hind sight should be placed. This mean angle of drift is usually called the permanent angle of deflection. The foresight is at a fixed distance from the axis of the piece. The hindsight is placed in a socket at the correct inclination to the vertical plane. It can be clamped at any height to give elevation and automatically eliminate the constant correction for drift. The forces of wind and speed of the object (target) need to be estimated by the gun layer and allowed for by means of the deflection scale. When graduating the scale of a tangent sight another factor to be considered is the amount of jump. This is the tendency for the gun and mounting to revolve around its rear point of support. 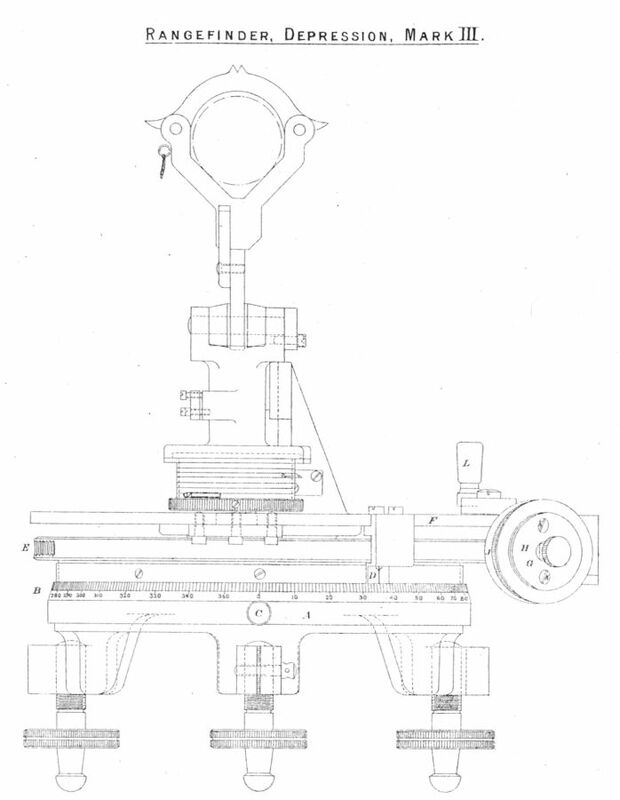 It is movement in the axis of the gun due to the projectile passing up the bore and is manifested as movement due to the spring of the mounting, play in the elevating gear, cradle guides and trunnion bearings. The amount of jump is calculated using another formula involving the time of flight and the measured distance between the expected point of impact and the actual point of impact. An adjustment is then made to the yard scale of the tangent sight. Droop must be considered as a factor in sighting a gun. It is the non-straightness of the bore of the gun. For sighting purposes it is measured as the angle which the axis of the gun in the last six calibres at the muzzle makes with the axis at the breech. Droop varies in individual guns of the same pattern. The method of sighting coast defence guns differs from that employed with field guns. Fixed mountings for coast defence guns are permanently levelled and the gun can be laid on the target using a sighting telescope, or can be directed using a range finder. The target is usually moving, sometimes at high speed; range and direction may therefore change continuously. The process of sighting and aiming a gun at a target so that you have some chance of hitting it is therefore a little more complex that it seemed at first. Niccolo Tartaglia, in the 16th. 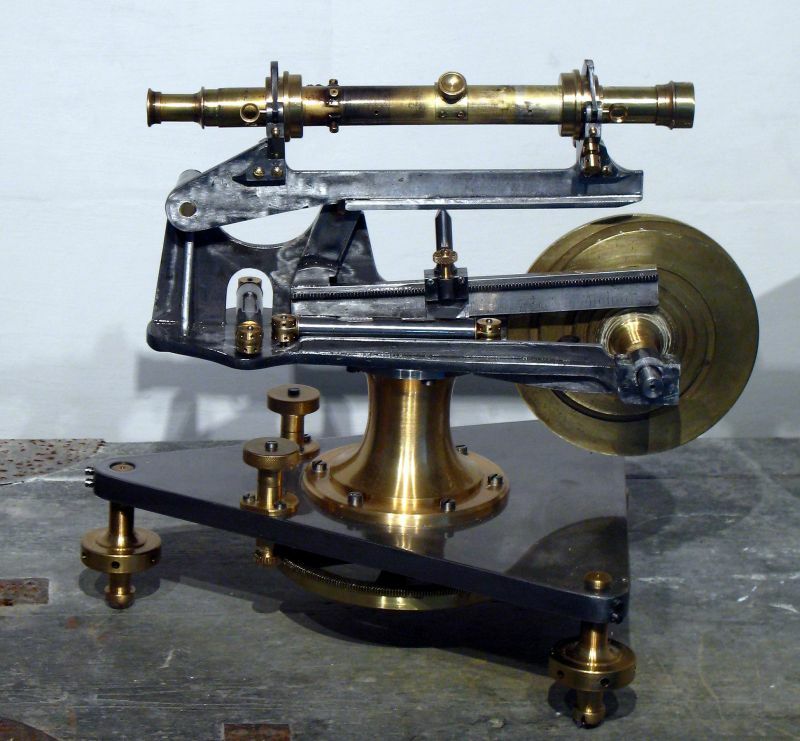 century, was the first to appreciate the basic rules of artillery and he produced a device by which a gun's angle of elevation could be altered to achieve a desired range. This became known as the 'gunner's quadrant‘. Tartaglia later appreciated that if a gunner wished to 'shoot by rule and not haphazardly‘ he needed to know two things, the range to the target and the range of his cannon at certain elevations. One was useless without the knowledge of the other. Without this knowledge a gunner achieving a hit did so by luck, not by judgement. In was unfortunate that although Tartaglia understood the necessity for these two requirements, at this time there was no accurate method of determining the range to the target, nor could the muzzle velocity of a weapon be measured in order to calculate the range tables for a gun. 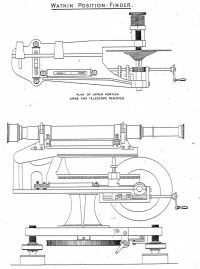 In the Victorian period muzzle velocities could be accurately measured and the necessary range tables produced using ballistic tables. 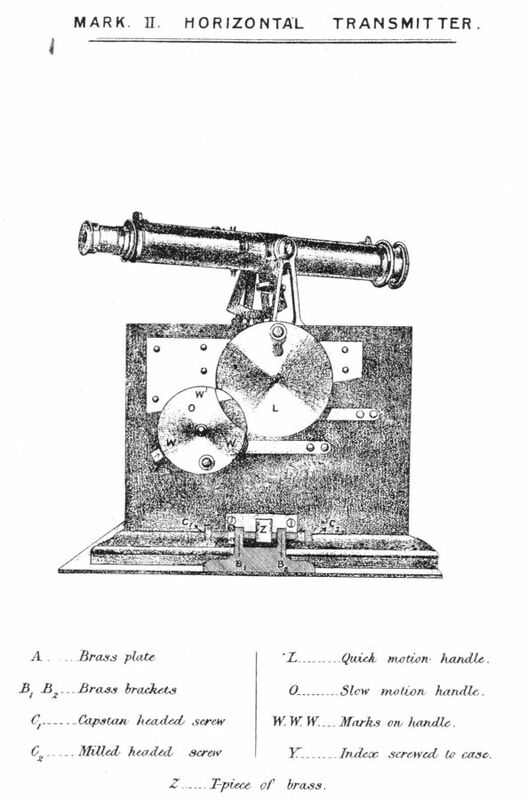 The Boulengé chronograph, improved by Captain Brewer of the French Marine Artillery was able to calculate the muzzle velocity of a gun by firing a projectile through two electrically wired screens. The time taken by the projectile to travel the horizontal distance between the two screens was recorded electrically in a nearby instrument room. The first of Tartaglia's axioms was achieved in the latter part of the nineteenth century when range finding instruments were developed. The first attempt was the mekometer. This was followed by the telemeter. Both depended upon the measurement of angles from the known base of a fixed length. Finally range finders were developed that could be placed close to the guns. It was the need to produce accurate range tables that resulted in the US physicist and engineer John William Mauchly, (1907-1980) constructing the first general-purpose computer in 1946, the ENIAC, in collaboration with John Eckert. The idea for ENIAC grew out of work carried out by the two during World War II on ways of automating the calculation of artillery firing tables for the US Army. In the Victorian period, as advances were made in the science of range finding and sighting guns, so coast batteries were fitted and updated with the latest range finders, position finders and fire control apparatus. By the 1880s coast defence batteries were fitted with two types of position finder, the horizontal and the depression. These were invented and developed by Major, later Colonel, H.S.S. Watkin R.A. and were sometimes referred to as Watkin Position Finders. The position finder was a highly complicated machine which transmitted to the gun mounting, by means of electrically operated dials, the correct gun range and training for engaging a hostile vessel. These were specially adapted so that the submarine mines could be fired by the position finder itself once the telescope of the instrument was sighted on the bow of the intended target. Electrical contacts on the table of the position finder ensured that the nearst mine to the target's position was automatically selected. The operator could then use the firing peg to detonate the mine. 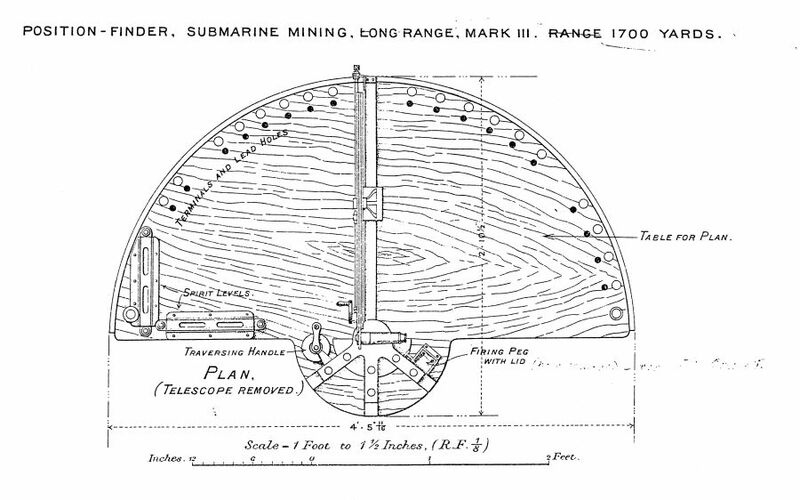 A Submarine Mining Position Finder in its cell. 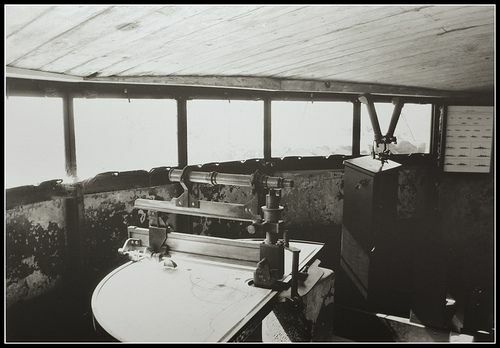 As we have seen, the depression range finder was at a known height above the water-line and by sighting a telescope on the target, the distance to the target could be calculated using the height of the range finder as the base of the triangle and the angle of depression. 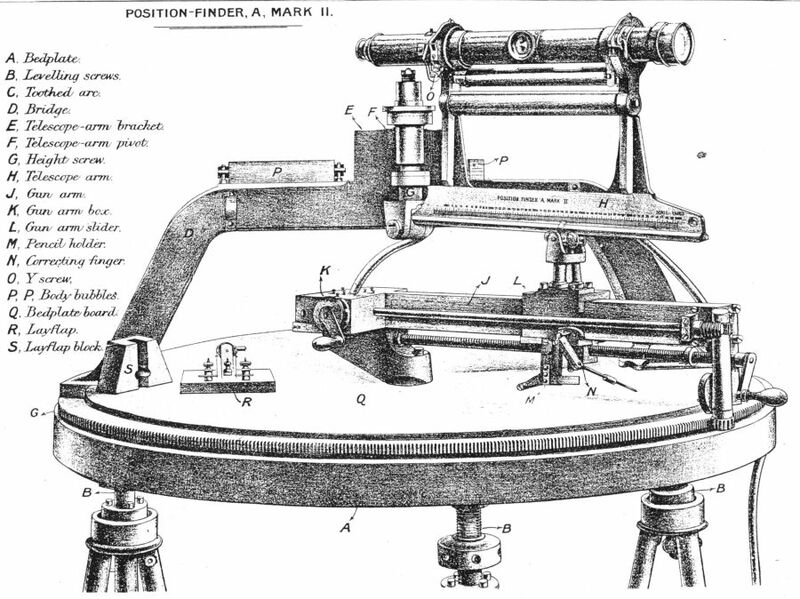 The horizontal position finder used two instruments. The receiving instrument and its transmitting telescope form the base of the triangle to the target, This distance being known it is a simple matter to calculate the range of the target. 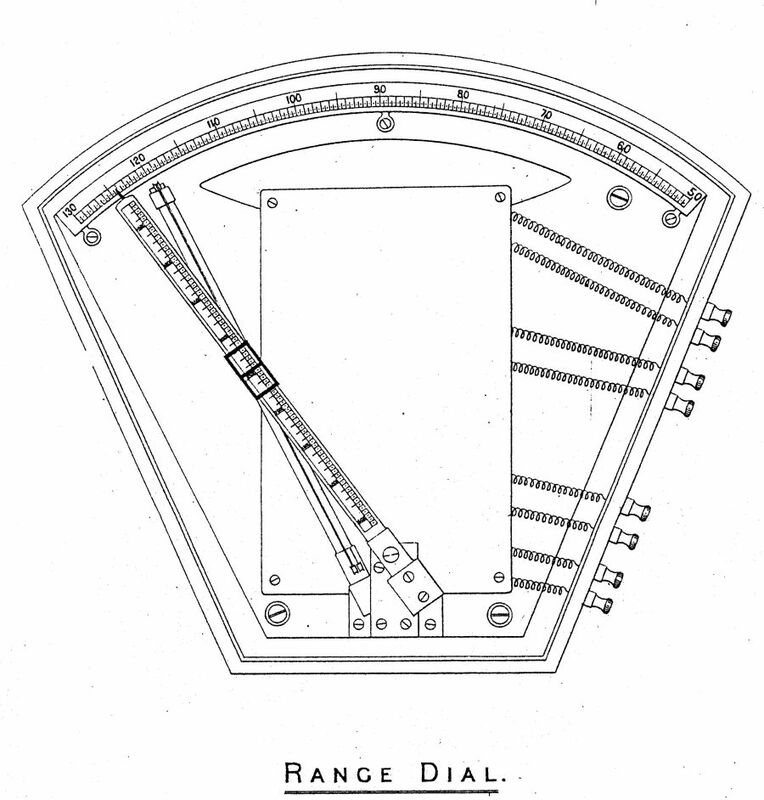 The difficulty arises in the conversion of this range and direction observed at the receiving station into corresponding figures for the gun, which may be some distance away. There is also a need for communicating this information directly to the gun, and instantaneously. Now if you already know the relative heights of the gun and the target would this not simplify matters? By measuring the elevation or depression of the target you can determine its range and pass this to the gun. 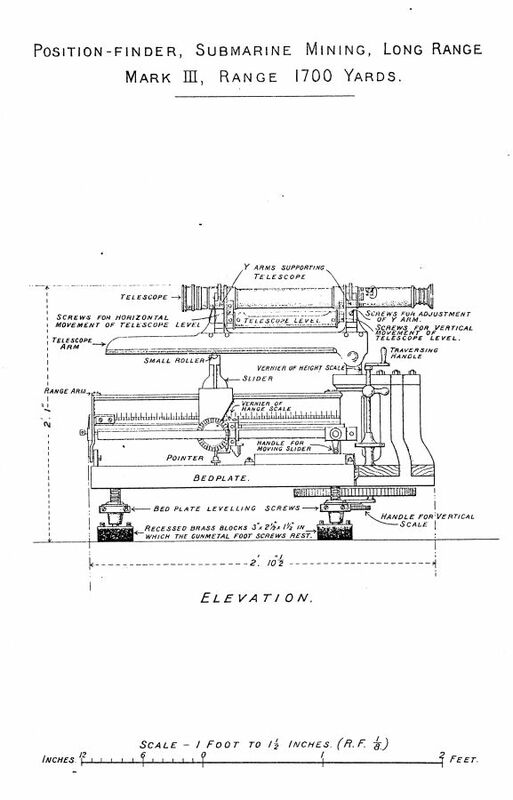 The gun layer could then use an elevation indicator marked out in terms of range and elevate the gun for that range. The range can be passed to the gun layer and automatically shown on a dial in the gun emplacement. The gun layer reads the range shown on his dial and sets the sight on his gun to that range. To communicate to officers or others in charge of the guns, the ranges and deflections of objects under observation an indicator board is used. One is situated immediately in rear of the observing station, and one in a position where it will be visible to a group of guns concerned. 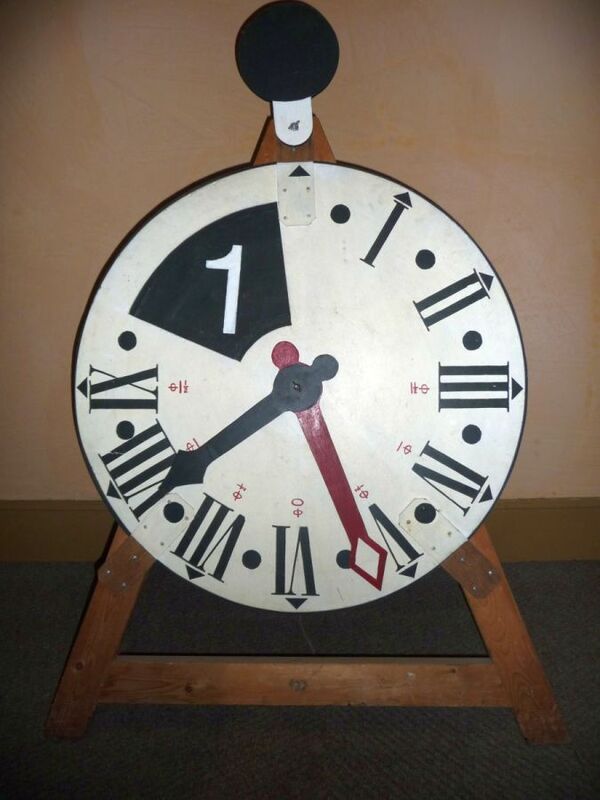 It consists of a wooden dial, painted white, with roman numerals from I to IX marked in black on it, similar to those on the dial of a clock, to represent the hundreds of yards in the range. In the space between the IX and I, a hole is cut to allow a black concentric disc to be seen. Figures 1 to 5 to represent the thousands of yards in the range, are painted on it in white, so that by turning the disc, one figure at a time can be seen through the hole. 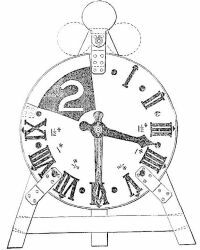 Two hands are pivoted to the centre of the dial, one with an arrow head painted black, the other with a diamond shaped head painted red. The black hand is for setting to the hundreds of yards in the range, and the red hand to the degrees of deflection right and left, the figures for the deflection being marked in red on the dial, right and left of VI. A movable black disc on top is used to indicate that the range is fixed or altering by leaving at the vertical or inclining it to the required side. The indicator is fixed on a wooden easel. These indicators are made locally, in such numbers as is authorised by the Commander-in-Chief, upon application by the Officers concerned, who will specify exactly the numbers required and the groups of guns for which each apparatus is intended. The auto sight (Automatic Sight) helps simplify things by linking the rangefinder with the sight. It sits on the gun where the conventional sight would be fitted and measures the target‘s distance from the angle it makes at the gun. [Fig 3] It relies upon the fact that the height of the gun above the water-line is known, and in the case of a coast defence gun, is fixed (apart from the rise and fall of the tide). This height can be used as the base of a triangle, one other side of which was the horizontal range. Gearing enables the gun to be moved as the sight is tracked on the target; the mechanism being arranged so that by laying on the target the gun is elevated to the correct quadrant elevation. It has an adjustment for tide levels. The auto sight was however a close range device. The advantage of the auto sight was that it made the gun independent, useful when the range finder was out of action and indispensable when multiple targets presented themselves and the rangefinder could only track one of them. The guns could then engage targets individually. 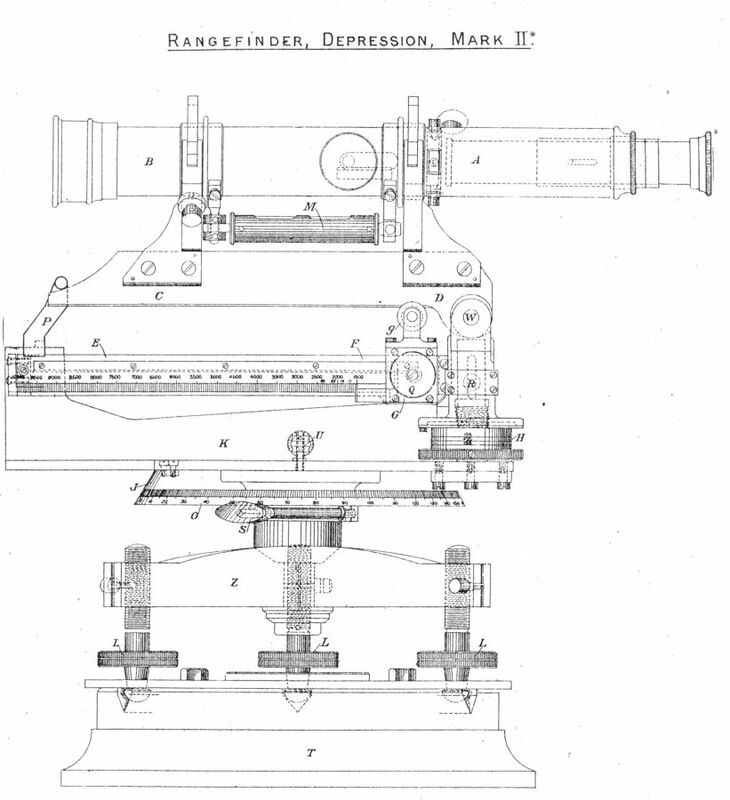 The depression range finder gives the range to the target, the automatic sight gives quadrant elevation, and as the gun and the sight are worked by the same mechanism the problem is solved directly and continuously by the act of laying the gun. The auto sight can only be used when the gun is at a height above the sea, and the distance at which it will be effective depends upon the height; it is limited by the power of the eye to appreciate a very small change of angle. By 1924 some attempts had been made to incorporate some form of one man range-finder with the auto sight, in order to be independent of the height of the gun above sea. The mechanical difficulties proved to be insuperable. The next innovation was to link the gun with the rangefinder and allow the observer to control the gun directly. In June 1894, Lieutenant-Colonel J .R.J. Jocelyn R.A. gave a lecture to the Royal United Services Institution, entitled Some Aspects of Coast Defence. In it he outlined the procedures in use for fire control and management of the guns in coast defence. The following extracts from this lecture give an insight into the complexities of commanding a coast battery in the late Victorian period. The smallest fighting unit of coast artillery is the group which should be composed of two or more pieces under the command of a group officer; two or more groups constitutes a fort, under a fort commander; while two or more forts make up a section under a section C.R.A. All the guns of a group should have the same field of fire, all the groups of a fort should command the same waterway, all the forts of a section should fire on the same line of approach. Although there are other officers and other commands and modifications of commands, this is the chain of responsibility and the object of the organisation is to bring every piece into action with its proper ammunition, as soon as it can bear on an enemy, to keep it in action till all objectives are disabled or out of range and to accomplish this end as quickly as possible. In order to lay a gun correctly, the range and training which will cause the projectile to hit the target must be known. In the Victorian period this information could not be supplied by the range finder alone, something else was necessary. 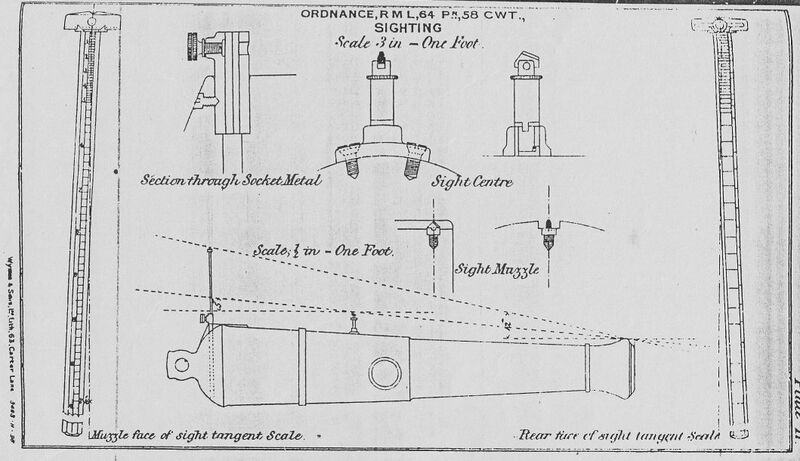 There were three service methods of gun laying known as 'Cases I, II and III‘ each of which was more suited to a particular set of conditions. In this, the tangent scale is raised to the proper height and the gun layer is responsible for line and elevation. The position finder (P.F.) 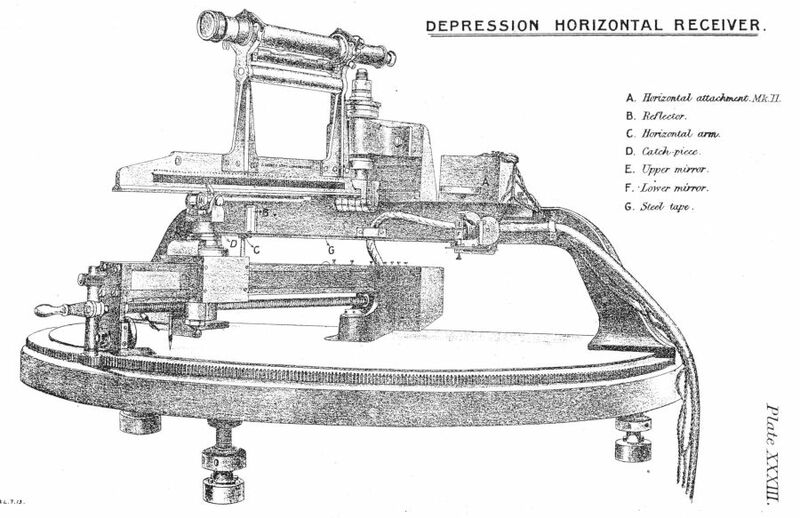 or the depression range finder (D.P.F.) is employed to measure the distance of the object. This method has the advantage that it is independent of the rise and fall of the tide and is more accurate than quadrant elevation; also from a high site errors in range are minimised by its use. The disadvantages are that it depends greatly on the visibility of the of the object and personal error is more likely to creep in. As the gun layer is obliged to jump clear before the gun is fired, and as it is more difficult to keep on the object than when only laying for line, it is less rapid than Case II; it is unsuited to salvo fire, and is awkward at night on account of the difficulty of seeing the graduations of the scale. The proper quadrant elevation is given to the gun, under the the superintendence of the gun captain, while the gun layer, standing on a sighting step, lays the gun for line with the aid of straight edged sights. The P.F. or D.R.F. can be used to measure the the distance of the object. The advantages of this method are that the gun can often be laid correctly when the view of the object from the gun is much obscured; the division of labour in laying eliminates personal error and helps speed and accuracy; it is convenient for salvo firing and night work, the gun layer remaining on the sighting step when the gun is fired and having no scales to alter. Its disadvantage is that if the correct range is not known the resulting error will be greater than with Case I. 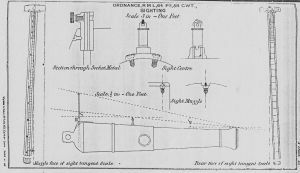 Case II is the normal method of laying coast defence guns. The sights are not used and the gun is layed by quadrant elevation and training arc, for what is called 'predicted firing‘. It is only possible with the P.F. 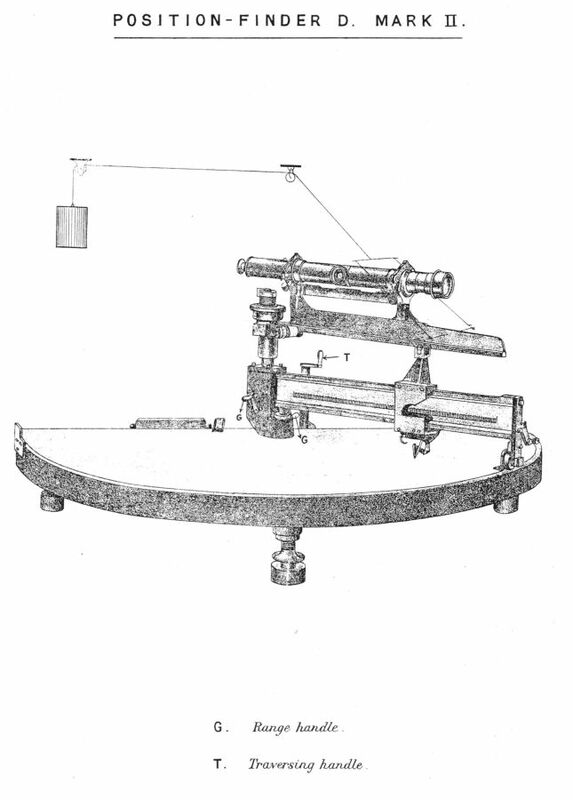 This instrument can be made to give the proper range and training at which to fire, before the time for firing arrives, this information being exhibited on group dials, which are in electric communication with the instrument. 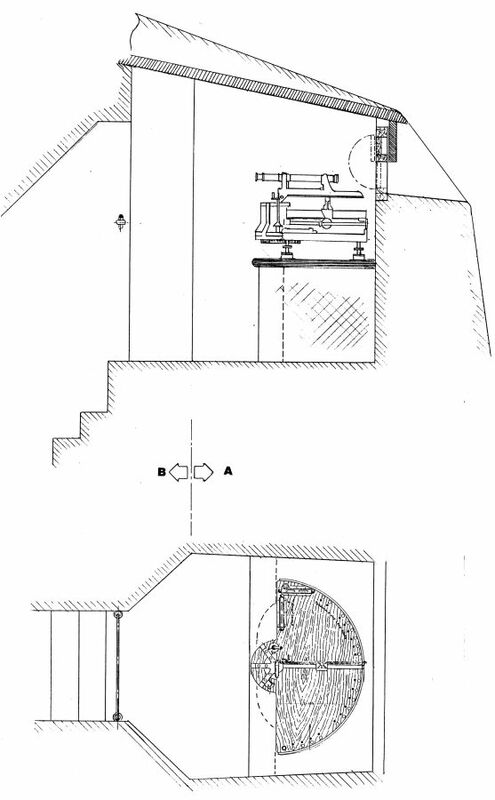 Quadrant elevation is given under the superintendence of the gun captain, while the gun layer sees that the mounting is traversed until its pointer is at the correct position over the graduated arc on the gun floor. At the proper time the gun is fired electrically. The advantages of this method are that a gun can be fired at an object totally invisible to the gun floor by being obscured by smoke, haze or the way the gun is mounted or placed. Partial invisibility due to weather conditions or long range can also be negated by this method. Its disadvantages are that in general guns shoot better and more rapidly when laid by the aid of sights, especially if there is any real displacement or distance between the P.F. 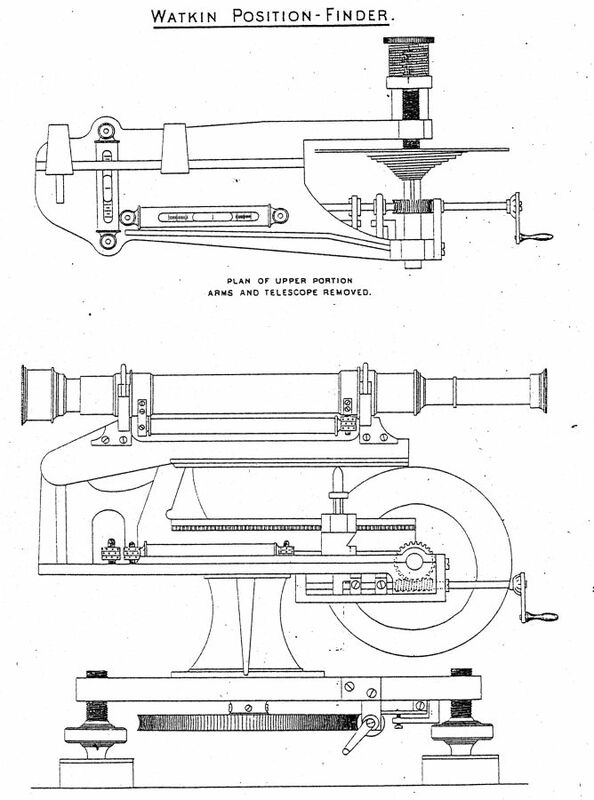 instrument and the group it serves [fig 4]. This method would be used for direct long range salvo and at all times when guns are mounted for high angle fire. Occasionally it presents advantages for night firing and must always be resorted to when laying by direct vision is impossible. 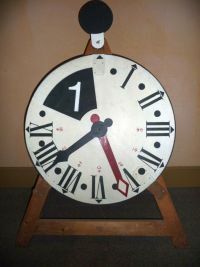 In all three cases the 'proper range‘ and in Case III the 'proper training‘ in addition, must be exhibited on the group dials. Either the P.F. or the D.R.F. if properly adjusted, can measure with great accuracy the distance between the object and the pedestal on which the instrument is placed. The former can in addition determine the distance between the object and the pivot gun of the group; but more than this is required; the fort commander is obliged to supply certain 'corrections‘ to the information. The strength of powder varies from time to time despite the proper precautions taken in sorting and weighing. A given batch may perform identically from day to day but a correction will generally be needed until the guns have warmed. Bad results were often ascribed to 'error of the day‘ which were really due to bad adjustment of instruments, defects in loading etc. Powder correction has to be considered in all the Cases, whether P.F. or D.R.F. is to be used. Tangent elevation is unaffected by height of site but quadrant scales have to be made for each fort; they are constructed so as to be suitable for the height of the work above mean tide; alterations to the latter will sometimes cause serious alterations in range. The necessary tide allowance will increase with the difference in mean level, in the height of the tide and the sharpness of the angle at which the shot strikes the water. Other things being equal, low sites and short ranges increase the importance of this correction. It must always be considered in Case III and also in Case II, whether P.F. of D.R.F. is used, It does not come in to Case I. This correction must be considered in Class I and II, whether P.F. or D.R.F. is made use of. When using the D.R.F. before the group officer orders any range to be put on his guns, he must compensate it for the difference between the distances of the object from the instrument and the pivot gun, and this he does by applying 'group differences‘ previously laid down, which depends on the displacement and the way the gun is pointing. 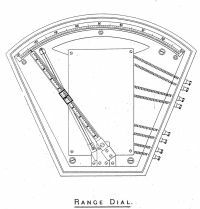 Having regard then for the time when it will be his duty to fire, and also to the way the range is changing as shown on the group dials, he gives a certain range, corrected for difference, to his guns, and orders them to fire when the range itself appears on the group dial. But before this can take place the following course is followed. The observer with the telescope (of the D.R.F.) follows the object, while another man watches the range drum of the instrument and calls out the ranges, in such a way and as such intervals, as may have been ordered by the fort commander, and in obedience to these calls, a third individual moves a large dial, close to the instrument, known as the fort commander's dial. 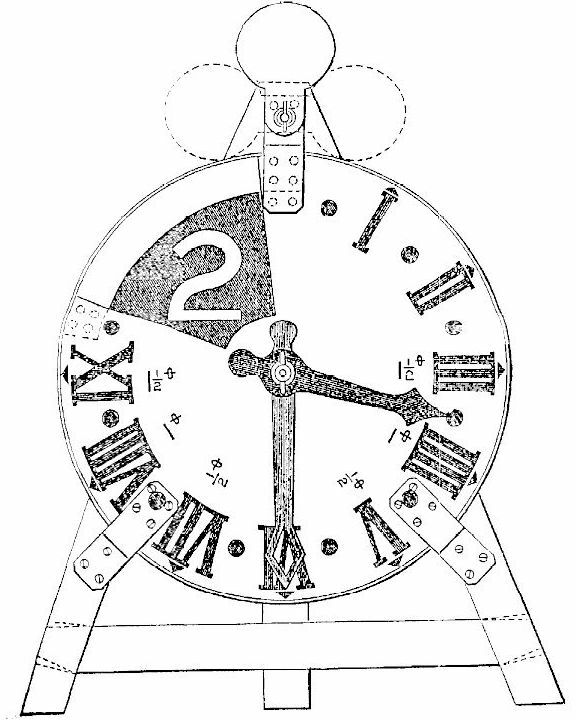 A fourth individual copies on the group dial, the movements of the fort commander's dial. When his selected range appears on the former, the group officer orders his group to 'commence firing‘. The gun layers see that their line is correct, and throw up their arms in Case II, or quickly finish their laying and jump down in Case I; at either of these signals, the gun captains involved, order their guns to fire, and the nos.4 pull their lanyards. Using the P.F. for finding the range, almost the same procedure is followed except that the group officers do not have to correct for displacement. The observer at the P.F. 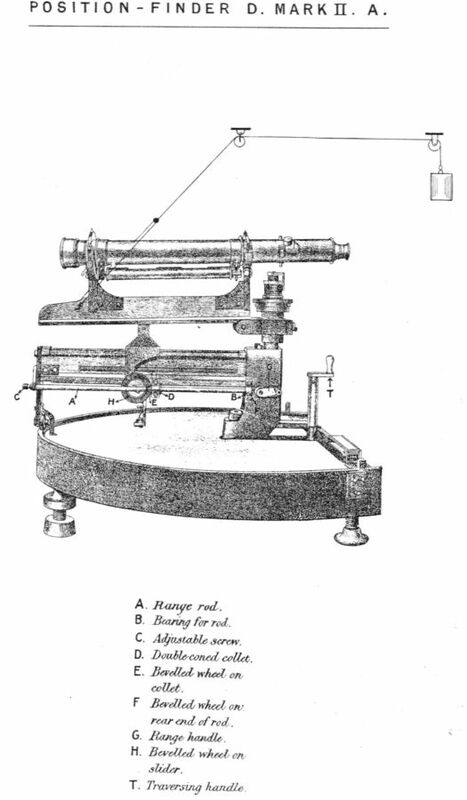 telescope having manipulated the instrument as ordered by the fort commander, follows the object and the group dial exhibits ranges. These are called out, at intervals, by the dial readers, and when the selected range is heard, the group officer orders his group to commence firing and gun layers, gun captains, and nos. 4 proceed as above detailed. The P.F., thus, saves group difference and three of the operations necessary with the D.R.F. The time taken up in this transmission of range is called the 'time of firing‘, and depends on the fort and the smartness of the men. After the gun is fired the 'time of flight‘ has to elapse before the shot strikes, and both during this period, and the 'time of firing‘, the position of the object may alter, the necessary allowance depending on its speed and direction. This correction is not required with Case III. In addition to these corrections for range, there are others that refer to training. In Cases I and II, either with P.F. or D.R.F. these corrections are made by giving a certain amount of deflection on the leaf of the back sight. They are necessitated by the effect of wind and the angular travel of the object during the time of flight, in case II, or the time made up of the latter and that taken by the gun layer to complete the gun laying, in Case I. In addition, if the bow or stern wave is made use of as lay point, deflection may be necessary, to bring the projectile to a certain part of the ship. In Case III not only have the above effects to be considered, but drift has also to be taken into account, as the gun is not laid by aid of the sights. With the exception of the group differences, all these corrections have to be evaluated and applied, wether by or under the authority of the fort commander. Not only has the range to be measured by the instrument, but the net correction has to be arrived at, and matters so arranged that it is not a distance only, but a corrected distance, that is transmitted to the group dials. The fort commander not only has to maintain discipline and command his men but he also has to be in a position to observe and correct fire. Arrangements therefore have to be made to place the fort commander in a properly chosen station. It should be so placed that there is a clear view of the waterway commanded by the fort; in an open work, the gun emplacements should be in sight where possible but they should certainly be within easy reach. There should be a pedestal for the D.R.F. whether there is a P.F. or not and the distance of this pedestal from the further group should not exceed 200 yards; if it is greater one set of group differences will not be sufficiently accurate for all ranges. The station should have sufficient room, be weather proof, clear of the blast of the guns in firing and should be provided with a map table. It should be connected electrically with the section Commanding Royal Artillery (C.R.A.) and arrangements should be made to ensure communications with the fort commander and his subordinates, of the kind best suited to the individual work. It may be necessary to provide two such stations either for the avoidance of smoke or for other reasons. In an open work the fort commander may easily have the greater part of the armament within vision, in a casemated work this may not be possible as the commander is bound to be on the roof. He will have perhaps two gun detachments aware of his presence or as many as are sited on the roof. The remainder would be aware of his presence and would be sure that he knows the progress of the action. He need only be at his station during firing and would be able to maintain normal discipline through his chain of command. When the P.F. is being used as the range finder an apparent difficulty arises as this instrument is generally sited outside the fort so as to be removed from the effect of smoke. It was the custom for the fort commander to be at the position finder whilst a subordinate officer represented him within the work. This was changed as each group of guns was provided with its own P.F. The man working it is a young gunner or N.C.O. of good eyesight and intelligence, in fact a glorified gun layer. Most works where the P.F. is installed have two or more gun groups and as it is impossible for the gun commander to be present at each P.F. He is usually stationed in a convenient central position where he can see the waterway and also communicate with his observers by voice, or orderly, usually the latter. In 1893 good results were obtained with the use of portable telephones, in particular the Siemens-Halski. Good telephones and sufficient practice should result in the fort commander being in the best place for fire control. He should be able to talk directly to the sub-commander at the observing station and telephone orderlies should now not be necessary. It may be better for a sub-commander to make certain corrections himself whilst at the P.F. rather than the fort commander. The fort commander by making use of the eyes and positions of his subordinates delegates but does not abrogate his functions; he should always be in control, for his office is to command.